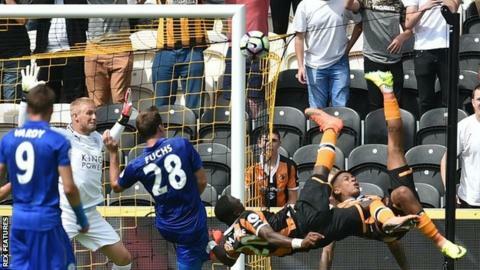 Leicester's defence of their Premier League title began with a shock defeat at newly promoted Hull, who are managerless and relegation favourites. Under caretaker boss Mike Phelan, Hull took the lead when Adama Diomande and Abel Hernandez combined acrobatically, with Diomande awarded the goal. Riyad Mahrez replied from the penalty spot at the start of the second half after Demarai Gray had been fouled. But Robert Snodgrass earned the Tigers victory after a cross was not cleared. Danny Simpson's clearance from Ahmed Elmohamady's ball into the area only found Snodgrass on the edge of the box, and he drilled home. It is the first time the reigning English champions have started the season with a defeat since 1989, when Arsenal lost at Manchester United. What was wrong with Leicester? The Foxes' title success was built on a solid defence and clinical finishing, but they managed neither at the KCOM Stadium. With Robert Huth suspended, summer signing Luis Hernandez came into the Leicester back four, which looked vulnerable whenever Hull attacked down the flanks. The defending champions also struggled up front, with Jamie Vardy missing their best chances - and they needed the help of referee Mike Dean for their equaliser. Tom Huddlestone appeared to stand on Gray's heels outside the Hull area, but he fell into the box and Dean pointed to the spot. Vardy, who scored 24 Premier League goals last season, miscued badly from two Musa pull-backs and had another follow-up effort blocked by Jake Livermore after Christian Fuchs' shot was saved. But otherwise Leicester created little against a makeshift Hull defence that featured midfielder Livermore at centre-half alongside Curtis Davies. BBC Radio 5 live analyst Chris Waddle felt the balance of Claudio Ranieri's side was wrong, with Gray, Musa and Vardy often all in the same area of the pitch. "Mahrez was great on the left but Gray kept cutting in from the left and the two strikers Musa and Vardy were almost holding hands with him. "N'Golo Kante has been sold so Andy King was playing in front of their defence, but he did not look like he has the energy to play there. "King likes to get forward - dropping off and getting the ball like Kante did is not his strength." There was a distinct lack of a party atmosphere at the KCOM Stadium as the game started, with home fans protesting against current owner Assam Allam and a lot of empty seats as well as banners. With no manager to replace Steve Bruce, no new signings since they were promoted via the play-offs and talk of a takeover, it was a far from ideal way for Hull to mark their return to the Premier League. Phelan's wafer-thin squad was expected to be cannon fodder for the champions, but he had clearly prepared them well because they started solidly and soon began causing Leicester problems. Their spectacular and slightly bizarre opening goal came from a well-worked corner routine that saw Davies nod on at the near post. They looked lively down the flanks, especially the impressive Elmohamady down the right, and rarely looked in danger when Leicester attacked. The Foxes only lost three out of 38 league games last season - to Arsenal twice and Liverpool - but while Hull's success was unexpected, it was also fully deserved for their organisation and endeavour. Leicester face Arsenal in their first home game of the new season next Saturday, the same day Hull travel to Swansea. Match ends, Hull City 2, Leicester City 1. Second Half ends, Hull City 2, Leicester City 1. Attempt saved. Daniel Drinkwater (Leicester City) right footed shot from outside the box is saved in the centre of the goal. Assisted by Daniel Amartey. Foul by Tom Huddlestone (Hull City). Riyad Mahrez (Leicester City) wins a free kick in the attacking half. Attempt missed. David Meyler (Hull City) right footed shot from outside the box is too high. Corner, Hull City. Conceded by Daniel Amartey. Robert Snodgrass (Hull City) wins a free kick in the defensive half. Foul by Ahmed Musa (Leicester City). David Meyler (Hull City) wins a free kick in the defensive half. Foul by Leonardo Ulloa (Leicester City). Attempt blocked. Adama Diomande (Hull City) right footed shot from outside the box is blocked. Assisted by Ahmed Elmohamady. Substitution, Leicester City. Leonardo Ulloa replaces Danny Simpson. Sam Clucas (Hull City) is shown the yellow card for a bad foul. Foul by Sam Clucas (Hull City). Ahmed Musa (Leicester City) wins a free kick on the left wing. Attempt saved. Robert Snodgrass (Hull City) left footed shot from a difficult angle and long range on the right is saved in the top right corner. Robert Snodgrass (Hull City) wins a free kick on the right wing. Sam Clucas (Hull City) wins a free kick in the attacking half. Foul by Shinji Okazaki (Leicester City). Attempt saved. Shinji Okazaki (Leicester City) header from the centre of the box is saved in the top centre of the goal. Assisted by Christian Fuchs. Attempt missed. Shinji Okazaki (Leicester City) left footed shot from outside the box is too high. Assisted by Ahmed Musa. Curtis Davies (Hull City) wins a free kick in the defensive half. Attempt blocked. Riyad Mahrez (Leicester City) left footed shot from the left side of the box is blocked. Assisted by Jamie Vardy. Corner, Leicester City. Conceded by Eldin Jakupovic. Attempt saved. Riyad Mahrez (Leicester City) left footed shot from outside the box is saved in the bottom right corner. Curtis Davies (Hull City) is shown the yellow card for a bad foul. Foul by Curtis Davies (Hull City). Shinji Okazaki (Leicester City) wins a free kick in the attacking half. Substitution, Leicester City. Daniel Amartey replaces Andy King. Substitution, Leicester City. Shinji Okazaki replaces Demarai Gray. Attempt missed. Tom Huddlestone (Hull City) right footed shot from outside the box misses to the left from a direct free kick. Abel Hernández (Hull City) wins a free kick in the attacking half. Delay in match Robert Snodgrass (Hull City) because of an injury. Attempt missed. Ahmed Musa (Leicester City) right footed shot from outside the box misses to the left. Assisted by Daniel Drinkwater. Attempt missed. Ahmed Musa (Leicester City) right footed shot from outside the box is high and wide to the right.